I have been writing about dividend investing on my website since 2008. This was a very tumultuous period for investors, which included sharp drops in prices through 2009, followed by a relentless recovery in stock prices ever since. As someone who gets a lot of interaction with regular investors through my website, I get to develop an understanding of popular investor sentiment almost at all times. As a long term investor, I find overall investor sentiment to be counterproductive for me, because it removes my focus on what really matters for my investing strategy. In my strategy, I try to acquire tiny pieces of ownership at attractive valuations, in large established dividend growing companies . These companies usually have a product or service that is unique and which customers purchase repeatedly. Many of these products are essentials that people use on an everyday basis, and are therefore relatively immune to recessions. The goal is also to purchase businesses that I can understand, and that would still be there in 20 years, while maintaining a strong competitive position. I also try to determine whether there are any catalysts that would bring more earnings per share and hopefully more dividends in 10 – 20 years. I expect to hold on to these companies for decades, or until something material changes that would make me want to sell. As such, I do not try forecast the direction of the stock market. In order to make my living. I simply have to find enough quality businesses selling at fair prices, and put my capital there. My success as an investor will depend on the overall level of success of the collection of businesses I partially own in my portfolio. For example, if Colgate Palmolive (CL) manages to sell more toothpaste in 20 – 30 years, it would likely earn more and pay higher dividends to me. In addition, if the rising number of babies in the US and China translates into the need for more diapers every year, Procter & Gamble (PG) would be able to sell more to new mothers. This is the type of things you should focus on as a long-term investor. In contrast, a lot of investors try to forecast interest rates, economic growth, quarterly earnings and so forth. This might be helpful for anyone who actively trades the markets, but is pretty useless for me as an investor in businesses. Ever since the end of 2009, the common sentiment I have heard from investors is that stocks are too high. I have been hearing that at least several times per year since then. There is always “a reason” why stocks as a whole should not go up. So far in 2013, I have been hearing that non-stop. 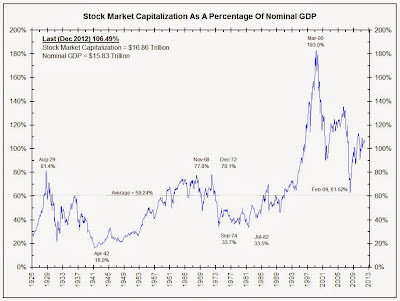 Two indicators that many investors seems to be using as a reason to avoid stocks these days are the market capitalization to GDP ratio, and the Schiller CAPE Ratio. The last item I will discuss are perma-bears, and the dangers they pose for long-term investors. 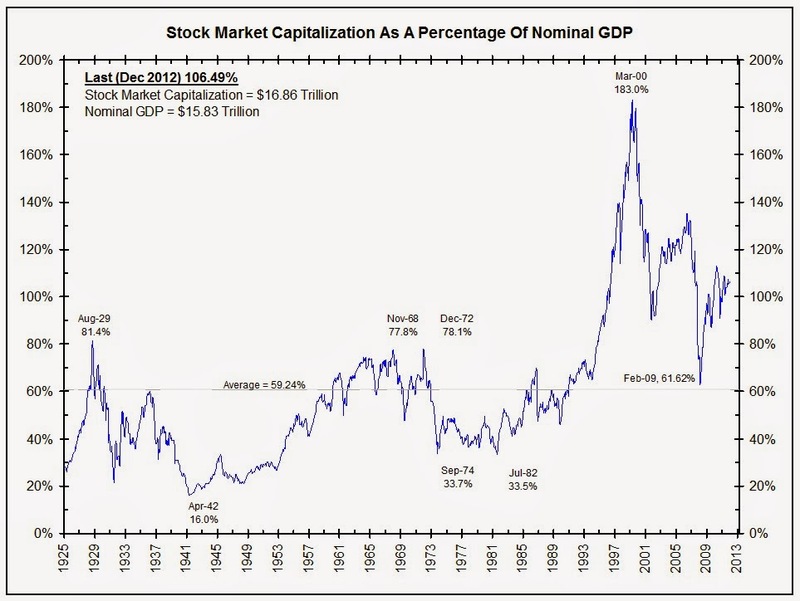 The market capitalization to GDP indicator is calculated by dividing the total US market capitalization to the level of GDP. Extremely high levels are supposed to have predicted the 1929 stock market collapse. However, I do not subscribe to this black magic for a few reasons. The first is that the increase in this ratio might not mean anything, especially as we have an increased financialization of assets. Estimated wealth in the US is approximately 3- 4 times the level of GDP or Market capitalization. If all the office buildings or rental units are no longer owned by private landlords, but are owned by publicly traded companies listed on NYSE, this would increase the Market Cap to GDP ratio. Therefore, all the increase in Market Cap to GDP ratio would show is that most of the wealth is now listed on a stock exchange. The second reason I believe that the Market cap to GDP is not useful these days, is because a large portion of US company profits are generated outside the US. For example, the ten largest components of S&P 500 derive almost half of sales from outside the US. In reality, I am not sure why any change in the market capitalization to GDP would mean anything of value to the dividend investor. A dividend investor should look at individual companies, and how their business is doing, and not make a macro bet on things. I also don’t follow Shillers Cyclically Adjusted P/E Ratio (CAPE), because it gives value to earnings which happened 10 years ago. For example, if a stock earned $50/share starting in 2004 for 5 years, but for past 5 years earns $100/share and EPS is relatively sustainable, should the stock be valued at 15 times times $75 (average of EPS over the past decade) or 15 times $100? This indicator has had stocks overvalued for several years since 2009, and currently is close to 25. In reality, S&P 500 has a P/E ratio of 18 or 19 times earnings, which got a little overstretched in 2013. Based on forward estimate however, the P/E ratio on stocks in general looks fair. However, as an individual investor, my goal is to pick individual stocks, not have opinions on everything that is publicly traded on a stock exchange. To put it in layman terms, in my previous job, new hires started at $48,000/year. Approximately 10 years before, the starting salary was $36,000/year. During recruiting, the potential new hires never asked the recruiter what the salary was five or ten years ago. All they cared about is the income they will make this year. I do agree that starting valuations have an impact on the returns an investor will generate. For example, if you paid 30 or 40 times this or next year’s earnings even for a blue chip stock like Coca-Cola (KO) or Wal-Mart Stores (WMT), you would not do very well. This is because your initial dividend yield will be ridiculously low, and the price you paid would have all the growth for the next decade already baked into it. In the case of Coca-Cola and Wal-Mart investors, who overpaid in 1999 – 2000, earned low returns over the subsequent decade. This was despite the fact that the underlying businesses produced stellar operating results during the same time period. In addition, one should focus on the current and future ability of the business to generate profits, and not focus on profits that were generated 5 or 10 years ago. That being said, I can find fewer good candidates to buy today than a year ago. However, there are few alternatives to stocks today, especially when fixed income securities won’t cover even a minimal increase in inflation. Another item I always choose to ignore are opinions from Perma-Bears. Perma-Bears are those highly intelligent analysts, who unfortunately always forecast doom and gloom. You can always find a perma-bear that would give you the reasons why stocks are going to crash by 50-80% - just pick a number. Now it is entirely possible that stock prices collapse and this triggers an economic contraction. However, the US economy is resilient and diversified, and US policy makers have managed to step up to the plate in difficult conditions to help out. Therefore, if we are lucky enough to get a stock market crash, this would be a short term opportunity for long-term investors to load up on quality companies at depressed prices. I believe that the future will bring in more people, more innovations, and a higher standard of living for humans. I see billions of people that are going to be lifted out of poverty over the 21st century. These people are very motivated to work hard and achieve their dreams, and lift themselves out of the poverty that previous generations lived under. Every morning, several billion people wake-up, and ask themselves how to live better lives for themselves, their families and their communities. If you believe that social order as we know it will collapse, and you are stocking up on guns, ammunition and gold, then chances are you will never be wealthy. Even at the super unlikely event that this happens, you will not do well, because the guns and gold can and would be taken away from you by a stronger opponent. Even for those milder forecasts of a mere depression coupled with stock market crashes, these occur only a few times per century. Are you willing to be wrong for 30 years in a row and miss out on a few thousand percent of gains, for the ability to predict a mere 50% crash? If you look at a long-term chart of Dow Jones Industrial's over the past century, you would see the 1929 – 1932 crash as a mere blip on that chart. Don’t be perma bull either. Be realist, and put money in opportunities where you stand to have a chance to make more than what you put in. Even in 1999-2000, there were pockets of opportunity for enterprising dividend investors. While difficult than a year ago, one can still find pockets of opportunity today also. You just have to look harder, and be able to capitalize on the rare selloffs. There are some investors who have been patiently waiting for a 40-50% crash FOR FIVE YEARS, and thus have ended up missing out on the recovery. Even if stocks did crash by 40% tomorrow, their performance would still lag a buy and hold of an index fund. There are a few perma-bears, who supposedly forecasted the 1987 stock market crash. Over the past 26 years however, I think they have continued being bearish. I don’t think you should be bearish on America if you are a long term investor. I also do not understand how someone can afford to lose money for a quarter century, and still be quoted in mainstream media. As I discussed in my article from yesterday, investors should be very careful about taking other's opinions at face value. You need to weigh in the credibility of this opinion, against relevant facts, before making a decision of whether it needs to be taken seriously or not.